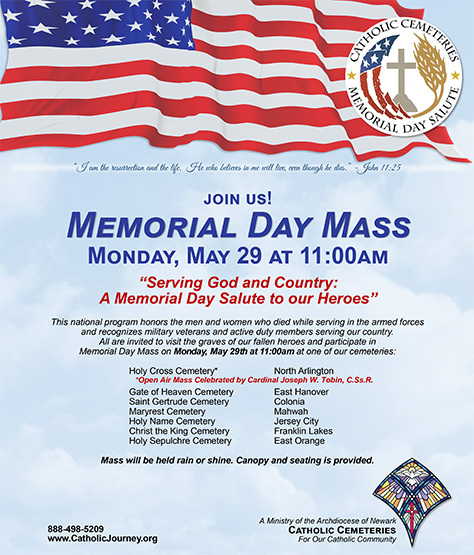 Catholic Cemeteries of the Archdiocese of Newark will join thousands of Catholic cemeteries nationwide in the commemoration, “Serving God and Country: A Memorial Day Salute to Our Heroes,” by celebrating Memorial Day Mass on Monday, May 29, at 11:00 A.M., at local cemeteries and parishes. The program commemorates all departed loved ones and honors men and women who died while serving in the armed forces and recognizes both military veterans and active duty members serving our country. 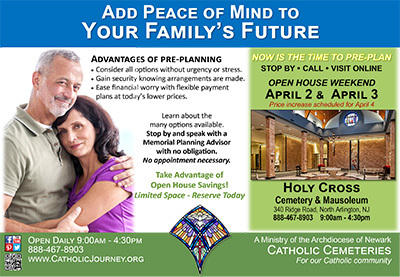 When a family suffers the loss of a loved one, about 50 difficult decisions must be made within hours, but cemetery pre-planning sets most details ahead of time and can ease much of a grieving family’s anxiety and burden associated with the difficult planning process. Catholic Cemeteries, NJ, May 27, 2013 – As the country prepares to celebrate Memorial Day, Catholic Cemeteries of the Archdiocese of Newark will join thousands of Catholic Cemeteries across the United States in a national celebration, “Serving God and Country: A Memorial Day Salute to Our Heroes.” This national program, developed by the Catholic Cemetery Conference, will honor those men and women who died while serving in the armed forces, as well as recognize both our active military and military veterans who have served our country. 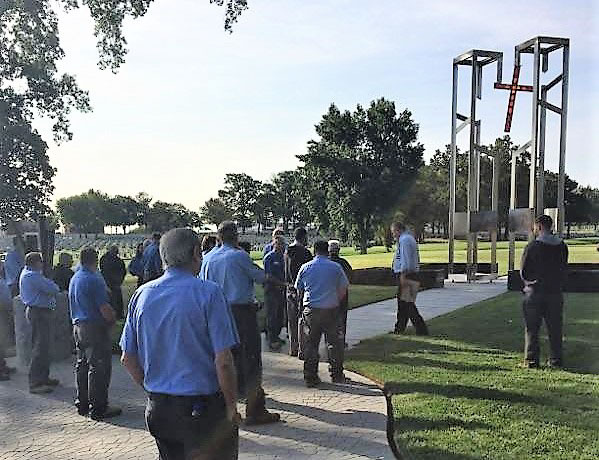 “Serving God and Country: A Memorial Day Salute to Our Heroes,” we invite our active military and veterans to participate in a Memorial Day Mass, and/or other cemetery-related activities throughout the weekend at Catholic Cemeteries. Veterans and active military are invited to serve as flag or candle bearers during the opening and closing processions at Mass, and will also be invited to serve as Lectors, participate in the Presentation of Gifts, and recite uniform intercessions followed by a moment of silence. 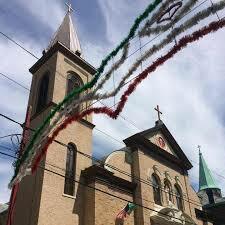 Thirteen stained-glass windows will be unveiled in their new home at the Holy Name Mausoleum in Jersey City on Saturday, November 6th. These artifacts, which are valued over $525,000, were removed from Saint Boniface Parish Church and have undergone a rigorous restoration, uncovering the true beauty of their nineteenth century craftsmanship.